Speakers at the panel discussion. 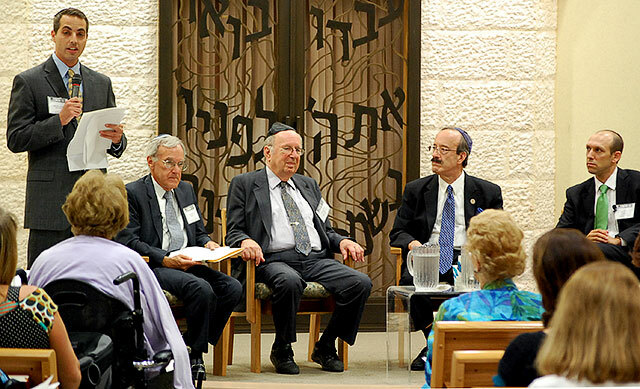 From left: Rabbi Michael Safra of B'nai Israel Congregation; Larry Sidman of Congregation Beth El Men's Club; Amb. Richard Schifter; Rep. Elliot Engel; and Eilav Benjamin, Counselor for Political Affairs, Embassy of Israel. A standing-room only crowd of close to 400 people packed the Swoff Chapel to hear three prominent individuals discuss the background and implications of a proposed initiative by the Palestinians to have the U.N. approve Palestinian Statehood. Guests included: Congressman Eliot Engel (D-NY); Embassy of Israel Counselor for Political Affairs Eliav Benjamin; and U.S. Ambassador to the UN, Richard Schifter. Click here to see a slide show of the event. Approximately 50 people attended this meeting, including representatives of other area synagogues, several African American ministers and others who had either attended the July 13th event or had learned of the Beth El meeting through Christian organizations that support Israel.